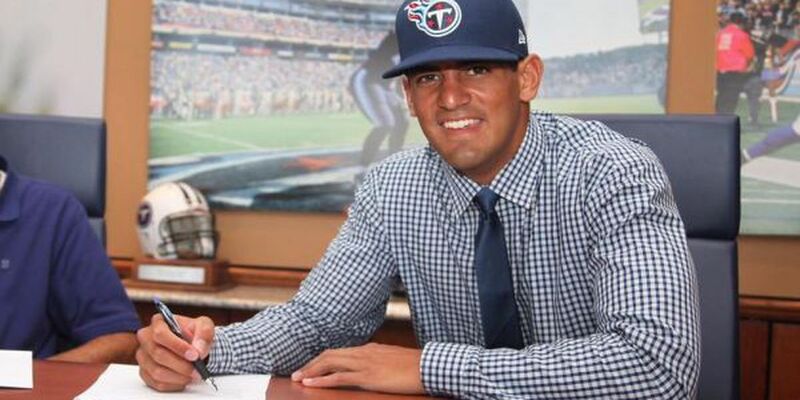 NASHVILLE, Tenn. (HawaiiNewsNow) - Marcus Mariota has agreed to contract terms with the Tennessee Titans. The No. 2 overall pick was the last unsigned first round pick according to ESPN. "We are glad to have the deal with Marcus done, and I'd like to thank both Marcus and his representatives for their diligence in working with us to finalize this contract," said Titans Executive Vice President and General Manager Ruston Webster. "We were confident that Marcus would be under contract before training camp, and we look forward to him starting his career on time with his teammates when we open camp next week. This is an exciting time for the Tennessee Titans organization, and we look forward to a bright future." The Titans selected Mariota with the second overall selection in the May draft out of the University of Oregon. The 2014 Heisman Trophy winner received a number of other accolades as a redshirt junior last season, including winning the Maxwell Award and being named Player of the Year by the Associated Press and the Walter Camp Football Foundation.